Alex’s language facility was, in some ways, more surprising than the feats of primates that have been taught American Sign Language…In 1977, when Dr. [Irene] Pepperberg, then a doctoral student in chemistry at Harvard, bought Alex from a pet store, scientists had little expectation that any bird could learn to communicate with humans, as opposed to just mimicking words and sounds. Research in other birds had been not promising. But by using novel methods of teaching, Dr. Pepperberg prompted Alex to learn scores of words, which he could put into categories, and to count small numbers of items, as well as recognize colors and shapes. Other scientists, while praising the research, cautioned against characterizing Alex’s abilities as human. The parrot learned to communicate in basic expressions — but he did not show the sort of logic and ability to generalize that children acquire at an early age, they said. Alex showed surprising facility. For example, when shown a blue paper triangle, he could tell an experimenter what color the paper was, what shape it was, and — after touching it — what it was made of. He was found dead in his cage the next morning, Dr. Pepperberg said. 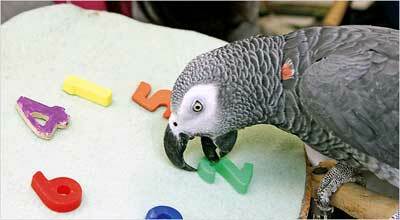 There are few “superstars” in the world of animal intelligence, but Alex was one of them. Rest in peace, little buddy.